So say you need to get a few hundred pounds of cocaine from Mexico to the US. Underground, preferably, so as not to attract too much attention. Where’s the best place one might, hypothetically, do this? Asking for a friend. Of the 27 drug tunnels discovered in raids along the California-Mexico border over the last 10 years, almost all of them terminate in a single San Diego suburb named Otay Mesa. 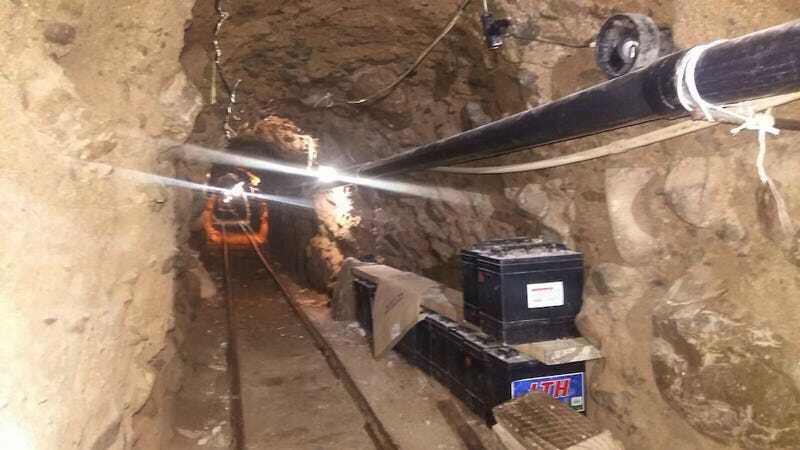 This includes the longest drug tunnel ever discovered, which was busted just last week: a 870-yard-long, three-foot-diameter work of infrastructural art which ran from an elevator shaft in Tijuana to the parking lot of a fake pallet business on the US side. The US Department of Justice discovered 11,030 pounds of marijuana and 2,242 pounds of cocaine—the largest single-seizure cocaine bust in Southern California tunnel history. What makes the Otay Mesa neighborhood such a prime destination for drug-running? It’s not a lapse in local law enforcement. It’s the soil. Otay Mesa is about 10 miles inland from the Pacific, but not too close to the nearby San Ysidro Mountains, making it perfect for digging. If the ground is too close to the ocean, it’s too wet, increasing the risk of flooding or collapse (although local groundwater aquifers still must be avoided). Closer to the mountains, the ground is too hard and can’t easily be excavated. The thin plume of sandy, rocky soil made from Pliocene marine deposits and volcanic ash fall that stretches from Otay Mesa to the area around the Tijuana airport—named Garita de Otay—is juuuuust right. You’d think that the combination of known geological factors plus the industrial use would mean that the DEA would be constantly swarming the lots, preventing any new tunnels from being dug. Or maybe, maybe, since the feds know that the tunnels can only be dug in such a narrow sliver of real estate, they’re quietly focusing their efforts here, letting the drug runners move in and dig away, then preparing for the next round of whack-a-mole.